September 3rd, 2018: Release 1.9.0.1026 of Import Image 2 Lotus Notes (II2LN) is out. First of all is every file in the package signed with updated certificates, meaning that Windows 10’s SmartScreen won’t make II2LN stumble on Windows 10. In addition a new and updated internal DXL-processor works even faster behind the scenes. Happy image importing. March, 23rd. 2018: Today a new bug-fix version of IEL was released. Another bug with key-updates were discovered. Thanks Larry B!. Head over to the IEL product page for more details! March, 17th. 2018: Today a new version of IEL went out the door. Head over to the IEL product page for more details! Try this if List Fields crash on your system! Another thing to bear in mind is that Windows gets more and more security from version to version. The latest Windows 10 does a fair amount of “sandboxing” to try to keep evil code out of harms way. This may lead to problems that we must know how to fix. Read on to see some extra tricks you can try out if List Fields bail out on you! Note that these tricks may work on Windows 7 too. January 6th, 2017; Today a new version of Notes Import Export Library was released. Only a little bug has been fixed since the last major version from December 2016. 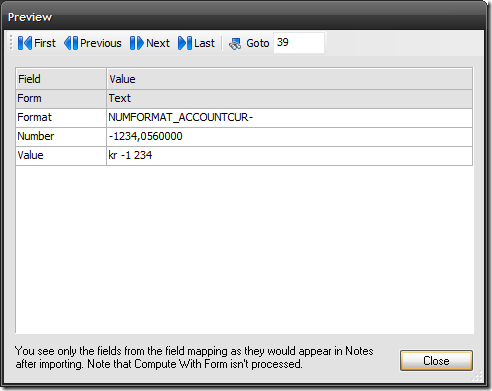 The bug occured during export to Excel if you had a formula field exported without a mapping. New release of Import Export Library. 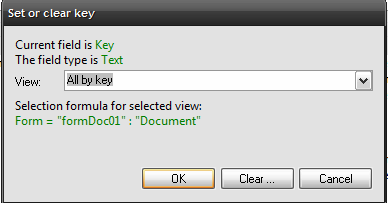 Now you can update your target Notes documents via key lookup! December 26th, 2016; Today a new release of Notes Import Export Library (IEL) has been released. You can download 1.2.0.4183 from the product page. Besides a lot of small bug fixes and some cool enhancements, the biggest news is the ability to update you existing Notes target documents with a key. 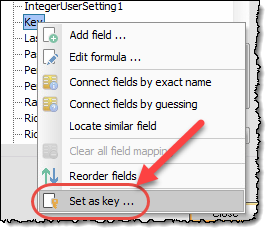 This means that IEL for each imported Excel or CSV record, will check if the value in the key-field is found in the lookup-view. If found, IEL will update the existing document instead of creating a new one. If you combine this new possibility with the ability to save import and export options (as *.vci or *.vce files), you can now pretty quickly have a scenario where you can quickly import - and update - any Excel or CSV file with a predefined option file. Remember, you can simply double-click on the option file to launch it directly witout the need to do any mapping first too. September 13th, 2016. Today you can download release 1.2.0.4005 of Notes Import Export Library! Amongst a bunch of fixes and other enhancements, the biggest news is that IEL now support import and export of Comma Separated Files (CSV) with the same ease and power as for the Excel files. With simple alternatives you can control both the format of the input file (and yes, IEL can read and write almost anything. Got EBCDIC for System i? No problem. Of course you can use “auto” to let IEL guess the input format for you!). 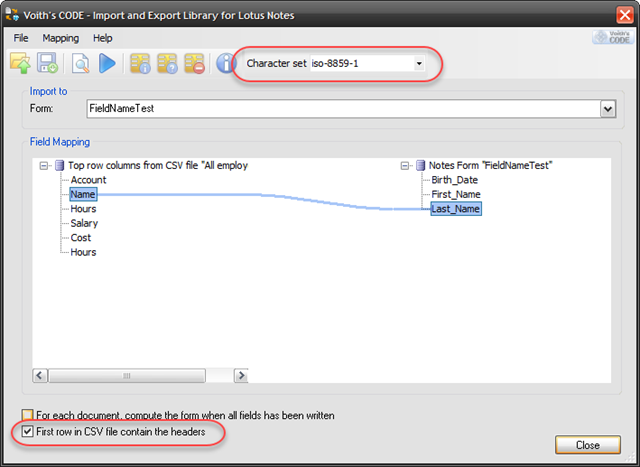 January 17th, 2016 was the date for a new release of Notes Import Export Library. This release has much better control on the import formats when you import from Excel to IBM Notes. Why does this matter? In previous releases IEL did just fine when you imported Excel numbers and dates to different corresponding data types such as numbers and dates in the IBM Notes documents. Note the stress on the target field type in IBM Notes. If you import Excel numbers and dates into Notes number- and date fields, IEL will first and foremost import the raw number or date into Notes, and then Notes will control how you actually display the data with the field’s display properties. Note how your locale’s currency is automatically added. Hopefully this will make you import to Notes text fields less frustrating! Finally a small enhancement. When you work with saved import or export specification files (vci or vce file types), it was kind of annoying that IEL kept insisting to open the file where you last saved it. It now also store the location from where you open your vci or vce files. Makes it a tad easier to work with more mappings. Head over to the product page to download the new version. Do List Fields crash on your Windows 10 x64 machine as soon as you try to start it? Perhaps you need to re-register a couple of DLLs again? Welcome to this site! Please click here to read more about Voith's CODE!